Most patients dread hearing the words “gum disease.” While gum disease is a condition that should be taken seriously, it is more common than many patients realize. 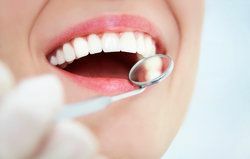 Most patients suffer from some degree of gum disease at one time or another, whether it is the earliest stages of gum disease (known as gingivitis) or a more advanced case. If left untreated, gum disease can have serious consequences, but with early detection and treatment, the health of the gums and teeth can easily be restored. Dr. Michael Bixby offers restorative dentistry care to improve the health of the teeth and gums so that patients can avoid serious dental problems that require more invasive treatment. For our patients in Red Bank, root planing and scaling is a treatment commonly used to address moderate to advanced stages of gum disease. This deep-cleaning procedure can often stop the progression of gum disease so that oral surgery can be avoided. All of these are signs that gum disease is present and an indication that professional dental care is necessary. Root planing and scaling is a minimally invasive treatment. While it is more thorough than a regular dental cleaning, it is much less invasive than oral surgery. Using local anesthetic, the gums are numbed so that patients remain comfortable throughout treatment. Dr. Bixby then removes bacteria, plaque, and tartar from around the teeth, at the base of the gum line, and beneath the gum line. The surface of the roots are also filed down slightly to create a smoother surface that makes it more difficult for bacterial to adhere to. Essentially, root planing and scaling is a deep cleansing of the teeth (including its roots) and gums. In most cases, treatment will be completed with an administration of antibiotics. These antibiotics may be in the form of a gel or rinse. By completing the procedure with an antibiotic treatment, Dr. Bixby can ensure that all harmful bacteria have been eliminated from the teeth and gums. With the teeth and gums cleansed of bacteria, plaque, and tartar, healthy gum tissue can regenerate and, once again, form a secure seal with the teeth. The health of the gums is essential to a fully functional, healthy, attractive smile. If you have experienced any of the side effects of gum disease, schedule an appointment at your earliest convenience to discuss your symptoms with Dr. Michael Bixby. Dr. Bixby can restore the health of the teeth and gums before more serious complications develop. We look forward to hearing from you!